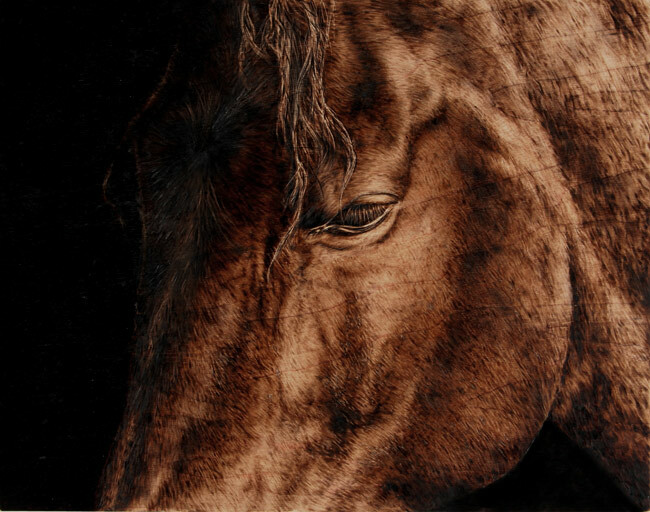 You are here: Home / All Posts / “More Fire!” The Stunningly Beautiful Pyrography Artwork of Artist Julie Bender! 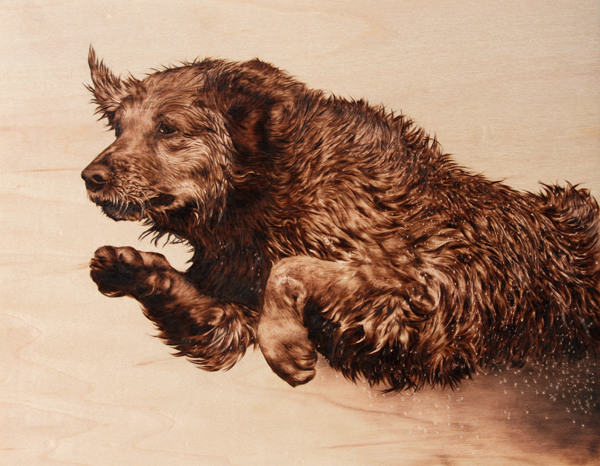 'Into the Light' pyrography on maple. Art by Julie Bender. All rights reserved. Not much makes me happier than some fire. I love building a fire, stoking a fire and just just plain staring at fire. I’m an Aries, of course, but I’ve also got a touch of pyromaniac in me. Not enough to have ever…you know…commited an arson or anything, but definitively enough to make some people wonder. Of all the posts I’ve done, and all the great artists I’ve featured this article: Love me some Fire! Molotov Art of Russian Artist Radya Timofey! is my absolute favorite. Be that as it may, I’ve found a completely different type of fire art. More specifically it’s a burning art. It may not be as exciting as Molotov art (what is really?!?) 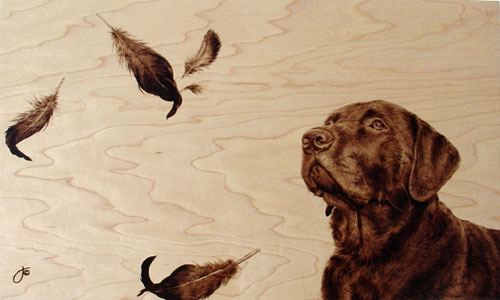 but artist Julie Bender shows an insane amount of skill and patience in creating her animal themed pyrography art. "Peruvian Splendor" pyrography on maple. Art by Julie Bender. All rights reserved. 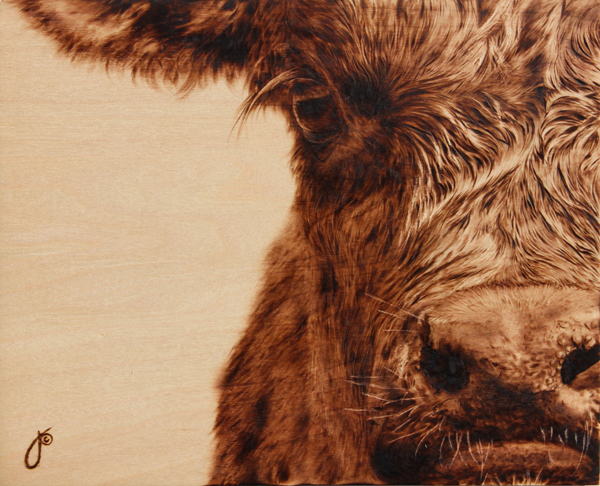 'The Loner' pyrography on maple. Art by Julie Bender. All rights reserved. 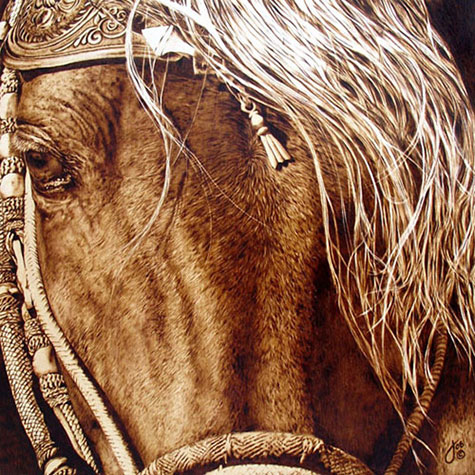 Pyrography, the art of burning or scorching on a natural surface was an art form practiced since the dawn of recorded time by Egyptian and African tribesmen fascinated by the mysterious beauty and power of fire. Defined in traditional terms, pyrography is the art of drawing with fire; using a heated tip or wire to burn or scorch designs onto natural surfaces such as wood and leather. 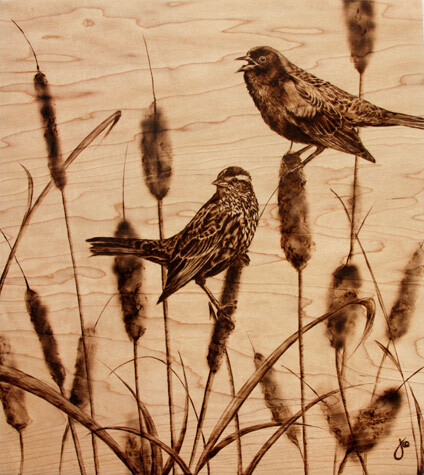 Modern day pyrography is typically done with solid-point tools, which resemble but are more sophisticated than soldering irons or hot wire tools. These tools are electrically heated by equipment that may allow temperatures to be adjusted, thereby producing a great range of natural tones and shades. Subtle or bold effects may be achieved, depending on many factors, including heat, pressure, type of wood or surface, and tool tips used. 'Close to You' pyrography on maple. Art by Julie Bender. All rights reserved. 'Ready and Waiting' pyrography on maple. Art by Julie Bender. All rights reserved. Inspired by animals and nature – and her Canon EOS Rebel T1i digital camera – her process begins by compiling inspiring photographs and penciling in her subjects on a well-sanded maple surface with a keen sense of composition and attention to wood grain. Light-handed strokes and smooth, subtle shading using very tiny tips characterizes her technique. She finds her personality well-suited for the challenge of this exigent art form as well as the extreme patience and considerable time that is required of her work. 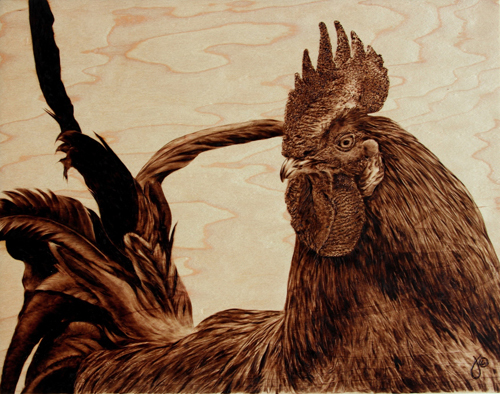 Julie states: “This unusual medium still has me marveling over the fact that my subjects may be brought to life solely by applying heat to wood.” It is precisely the uniqueness of this medium and the realism Julie achieves that draws the attention of collectors to her work. 'Pick One' pyrography on maple. Art by Julie Bender. All rights reserved. 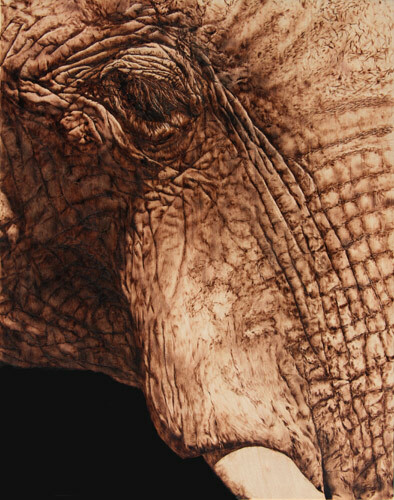 'Elephant Portrait' pyrography on maple. Art by Julie Bender. All rights reserved. 'Tall Tails' pyrography on maple. Art by Julie Bender. All rights reserved. Bender’s work has that magical touch. She has skill. She has talent. But most importantly, she has an incredible love for her subject and art. It’s there, visible in her work. And it’s what makes her work so beautiful. I wish I had half the passion, half the determination that she does. It is for this passion (as well as her phenomenal art!) that Give Us Art! salutes you Julie Bender! Once again, this post inspired by Spooky and his awesome website www.odditycentral.com. « Special Effects Mayhem with The Shoggoth Assembly! “stunningly beautiful” is an apt description of this artist’s work!!! the detail is magnificent….she is a true talent….the work in the eyes pulls you in to the soul of the animal….you wonder ‘what are they thinking’….I would love to watch her create!!! Well done!! !…to the artist and to the host of this blog…,who is himself an awesome artist in his own right…..
You are very welcome! It was even more fun to discover than it was to share!! !